If you’d like to have a look at the complete implementation of the game, check out https://github.com/rundis/elm-sweeper. There you’ll find instructions on how to get it running too. Right! So I’ve taken an interest in Elm lately. If you’ve read any of my previous posts you might have noticed that I’m quite fond of Clojure and ClojureScript. I still very much am and I have tons to learn there still. But I wanted to dip my toes into a statically typed functional language. Elm seems quite approachable and I guess probably the talk "Let’s be mainstream" made my mind up to give it a go. After creating a language plugin for Light Table: elm-light and attending an Elm workshop at CodeMesh, I needed something concrete to try it out on. So the obvious place to start was the game logic. I had the option of trying to set up Elm-Test to use a test-driven inspired approach. 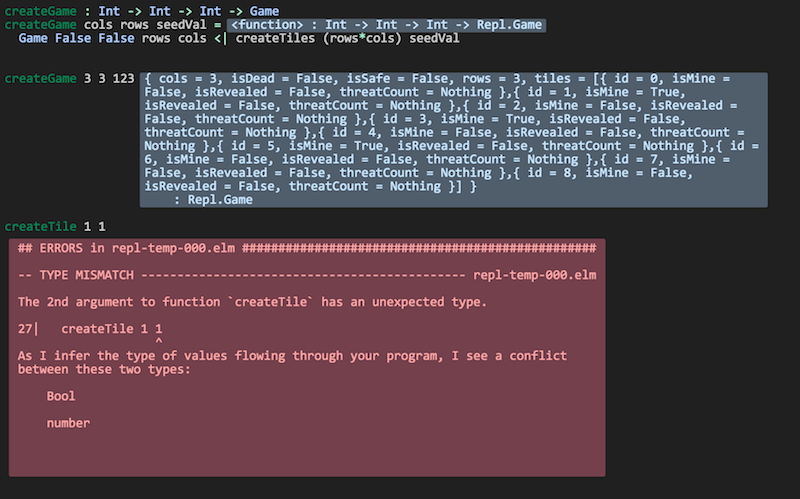 But heck I figured I had to try to put those types to the test, so I went for an all out repl driven approach. That gave me a chance to experience the good and bad with the repl integration of my own Light Table Elm plugin too. 1 Type alias for records representing a tile in the game. 2 Threat count is a property on a tile that is not set until the game logic allows it. Describing these types proved to be valuable documentation as well as being very helpful when implementing the game logic later on. What’s that Maybe thing ? If someone told me it’s a Monad I wouldn’t be any wiser. I think of it as a handy way of describing that something may have a value. A nifty way to eliminate the use of null basically. It also forces you to be explicit about handling the fact that it may not have a value. You won’t get null pointer errors in an Elm program! (nor Undefined is not a function). 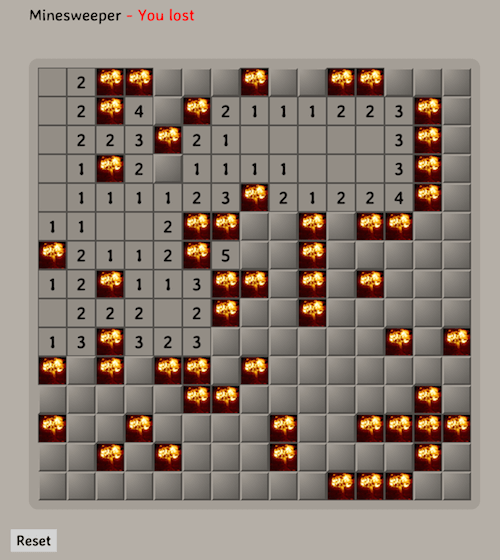 When revealing tiles in minesweeper you also reveal any adjacent tiles that aren’t next to a mine. In addition you display the threat count (how many mines are adjacent to a tile) for tiles next to those you just revealed. So we need a way to find the neighbouring tiles of a given tile. 4 Keep is a helper function that maps over the collection and filters out any resulting `null`s. So the function iterates all directions (invoking their respective function) and returns all possible tiles neighbouring the given tile. 6 Pattern match on tile and direction. You might consider it a switch statement on steroids. 10 We map over all directions finding their neighbours, then List.filterMap identity filters out all List entries with Nothing. Leaving us with a list of valid neighbours for the given tile. 2 Almoust the same as addThreatCount, but since once we add it the tile would also always be revealed I opted for a two in one function. For mine count, both implementations are potentially flawed. The elm implementation won’t have any null pointer exceptions, but really it should return Maybe Int to guard against giving 0 back for a Nothing tile ! return !game.getIn(['tiles', pos, 'isRevealed']) ? Anyways, enough about the game logic. Let’s move on to the view part. 1 This function returns a function for creating the react component tree for the game. It takes a channel param, which is an event emitter. So when components need to notify the "controller" about user actions they can just emit messages to this channel A neat way to avoid using callbacks! 2 createComponent is a handy helper function that avoids some react boiler plate and provides an optimized shouldComponentUpdate function for each react component used. 2 When a tile is clicked a message is sent to a given address (we’ll get back to that a little bit later). Well actually it doesn’t happen right away, rather think of it as creating an envelope with content and a known address. The Elm runtime receives a signal back that will take care of sending the message to it’s rendering function when appropriate. Signal.Address Action : Address points to a particular type of Signal, in our case the Signal is an Action we’ll come back to that shortly. But the short story is that this is what enables us to talk back to the main application. 3 Event listener for reveal messages. It invokes reveal tile, adds to history (and potentially ends the game). This is all very neat and tidy and works so great because the game state is managed in one place and is passed through the ui component tree as an immutable value. The fact that the state is immutable also makes the undo implementation a breeze. I really like this approach ! If you don’t know Elm at all, this part might be the most tricky to grasp. To simplify things I’ll split it into two parts. Start-app is a small elm package that makes it easy to get started with an elm Model-View-Update structure. This is a great place to start for your first elm app. 1 Type describing the actions the game supports. Currently just revealing tiles, and you can see that we also specify that the RevealTile action expects an Int paramater. That would be the tile id. 2 The init function provides the initial state for our application. 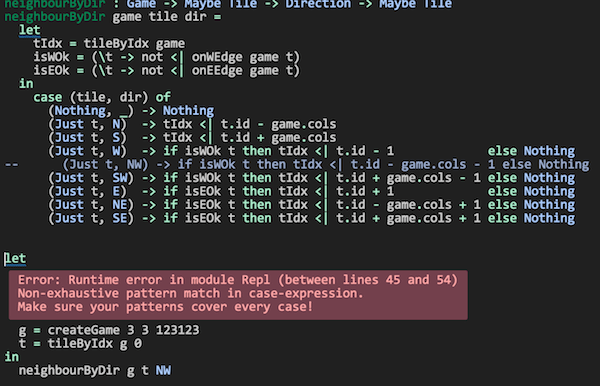 createGame is a helper function for creating a game with x cols and y rows. The 3.rd param is a seed for randomizing tiles. We’ll return to that seed thing in the next chapter! Do you remember the 3rd param to createGame in the previous chapter? That is the initial seed to a random generator (Random) to randomize the occurence of mines. The problem is that using the same seed produces the same result. Calling an elm random generator will return a new seed, so of course I could/should have stored that and used that for the next game. But I still need an initial seed that’s different every time I start the app. Current time would be a good candidate for an initial seed. But there is no getCurrentTime function in Elm. Why ? It’s impure, and Elm doesn’t like impure functions. By "pure", we mean that if you call a function with the same arguments, you get the same result. There are several reasons why pure functions is a great thing (testing is one), but I won’t go into that, let’s just accept the fact that this is the case, so how can we deal with it ? Well the elm-core package has a Time module with a timestamp function that looks useful. To use that we have to change a few things though, most notably we can’t use the simple start app approach any more. 7 Unfortunately I couldn’t figure out how to get the timestamp passed to the init function. The creation step (4) of the mailbox doesn’t actually cause the NewGame action to be executed either. So this is a little hack that fires off a task to execute the NewGame action. This is run after initialization so when you load the game you’ll not see state 0 for the game, but actually state 1. If any elm-ers out there reads this, feel free to comment on how this could be done in a more idiomatic fashion! I found this blogpost very illuminating for deconstructing start-app. But what about undo ? There is an elm-package I think would help us do that quite simply; elm-undo-redo. However if you are using elm-reactor you pretty much get undo-redo and more out of the box. Great for development, but maybe not so much for production! Elm: Building Reactive Web Apps - A really nice step-by-step tutorial with videos and examples to get you up to speed. You get great value for $29 I think. Elm: Signals, Mailboxes & Ports - Elm signals in depth. Really useful for getting into more detail on what Signals are, how they work and how to use them. Elm Architecture Tutorial - Tutorial outlining "the Elm Architecture"
Maybe Array would be a better choice than List for holding tiles ?